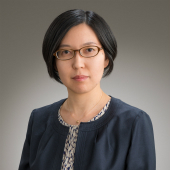 Home > People > Fumi KATOH, Ph.D.
Dr. Katoh received her PhD for her research concerning the osmotic and ionic regulation mechanisms of bodily fluids, and performed post-doctoral research at the University of Alberta and St. Francis Xavier University in Canada. She has extensive experience in the field of intellectual property, having been employed previously at a patent law firm and in the IP department of a research center. Fumi Katoh, Regina F. Cozzi, William S. Marshall and Greg G. Goss, Distinct Na+/K+/2Cl- cotransporter localization in kidneys and gills of two euryhaline species, rainbow trout and killifish Cell and Tissue Research 334(2): 265-281 (2008). Fumi Katoh, Martin Tresgurres, Kyung Mi Lee, Toyoji Kaneko, Katsumi Aida and Greg G. Goss, Cloning and characterization of rainbow trout SLC26 A1 expressed in the first segment of renal proximal tubule American Journal of Physiology, Regulatory, Integrative and Comparative Physiology 290: R1468-R1478 (2006). Fumi Katoh and Toyoji Kaneko, Short-term transformation and long-term replacement of branchial chloride cells in killifish transferred from seawater to freshwater, revealed by morphofunctional observations and a newly established ‘time-differential double fluorescent staining’ technique The Journal of Experimental Biology 206 (22): 4113-4123 (2003). Fumi Katoh, Susumu Hyodo and Toyoji Kaneko, Vacuolar-type proton pump in the basolateral plasma membrane energizes ion uptake in branchial mitochondria-rich cells of killifish Fundulus heteroclitus, adapted to a low ion environment The Journal of Experimental Biology 206 (5): 793-803 (2002). Fumi Katoh, Sanae Hasegawa, Jun Kita, Yasuaki Takagi and Toyoji Kaneko, Distinct seawater and freshwater types of chloride cells in killifish, Fundulus heteroclitus Canadian Journal of Zoology 79 (5): 822-829 (2001).